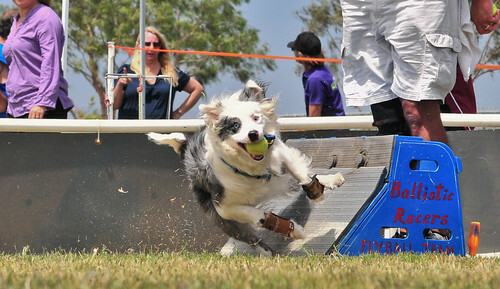 Some flyball dogs are well suited for two or more sports, not just one. On our team alone, we have several dogs who do agility, lure coursing, and dock diving as well as flyball. The key issue here is to know the capability of your dog since every dog is different. Some canines adapt well to flyball, while others are great at agility. Still others have no problem doing both. Determine what sport your dog is good at, and then concentrate on that particular sport. Once your dog has some sports experience, you can move on to other sports. Your pet is smarter than you think. They will know the difference between the various sports and adjust to each venue. If your dog looks like he is not having fun, then he needs to try something else. Usually you can find a sport which suits your dog and you will like as well. Our dog Zippy loves to play flyball and do agility. He is an excellent swimmer, and could probably do other dog sports if we had time. When doing multiple dog sports, it’s usually the handler’s availability which limits the number of sports the dog can do. Zippy lives for flyball and enjoys giving the opposing start dog a “run for his money”. In agility he anticipates the course and runs at full speed. You can see his enjoyment in the following Petco Commercial, as he leaps over the hurdles and whips through the weave poles. In agility he combines the speed and jumping ability he has learned in flyball with his natural ability to make sharp turns and quick decisions. Zippy loves the challenge and speed of both flyball and agility. Whatever sport or sports you choose, get out there with your dog and enjoy your time together. High energy dogs will find their own fun and it might be your sofa, cabinet door, or favorite recliner. Dog sports are some of the most rewarding fun you can have with your pooch so get started today!